Newark Museum, New Jersey; Jean Paul Blachere Foundation, France; Indianapolis Art Center, Indiana; United States Embassy, Abuja, Nigeria; Orchid Resorts and Hotels, Lagos, Nigeria; Four Seasons Hotel and Resorts, California; North Park University, Chicago, Illinois; World Bank, Washington DC; Brooklyn Academy of Music, New York, New York; Eko Hotel and Suites, Lagos, Nigeria; Halls Winery, Napa, California; Royal Collections, Abu Dhabi, UEA; Art House Contemporary, Lagos, Nigeria; Channel 4, London, UK; Renaissance Capital, Moscow, Russia; Sina Jina Collection, London, UK. 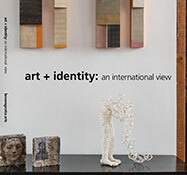 Exhibition venues: Mattatuck Museum of Art, Watebury, Connecticut; Memphis Brook Museum of Art, Tennessee; Samuel Dorsky Museum of Art, State University of New York, New Paltz, New York; N'Namdi Center for Contemporary Art, Detroit, Michigan; Museum of Arts and Design, New York, New York; Peabody Essex Museum at Salem, Massachusetts; Museum of Contemporary African Diasporic Art, New York; Spelman Museum of Fine Art, Atlanta; Museu Afro Brasil, Sao Paulo, Brazil; Palais des Papes, Musée du Petit Palais, Musée Calvet and Musée Lapidaire, France. 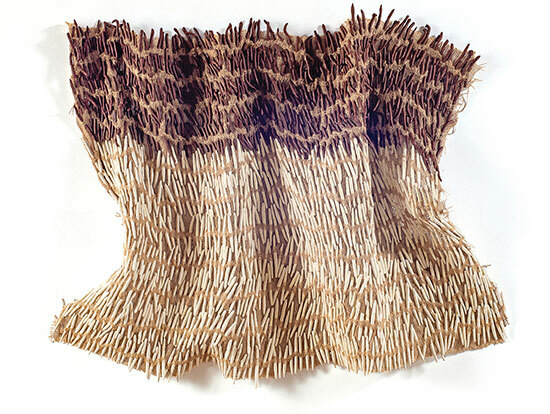 Nnenna Okore's highly tactile sculptures respond to the rhythms and contours of everyday life, combining reductive methods of manipulating materials with fiber techniques like weaving and stitching. Also, informing her aesthetics are familiar sounds of sweeping, chopping, talking and washing, processes that reflect the transience of human labor and its inevitable mark on the material world. 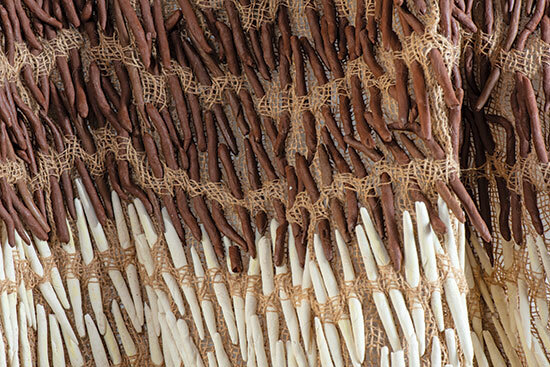 "...My processes of fraying, tearing, teasing, weaving, dyeing, waxing, accumulating and sewing allow me to interweave and synthesize the distinct properties of materials," Okore explains. "[M]uch like impermanent earthly attributes, my organic and twisted structures mimic the dazzling intricacies of fabric, trees, barks, topography and architecture. 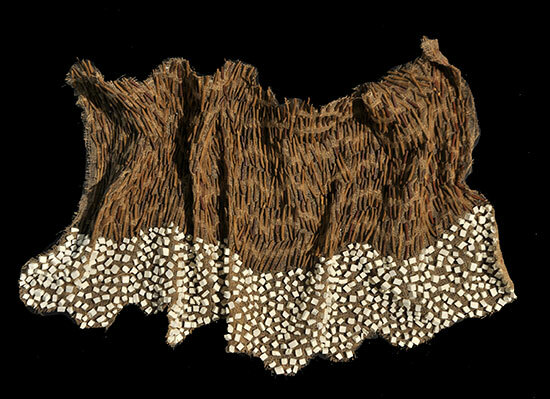 All my processes are adapted or inspired by traditional women’s practice, the African environment, third-world economies, and recycled waste," she adds. "I desire to heighten through my works, a perception and appreciation for colors, textures, undulating contours, movements and the mystic occurrences within our ethereal world."